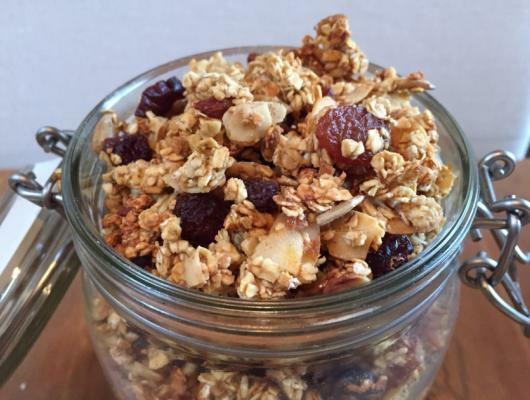 Foodista | Recipes, Cooking Tips, and Food News | Easy Granola with Goji berries, nuts and seeds! Set the oven to 275° F. Mix all dry ingredients in a mixing bowl using a spatula. Add cinnamon and other spices. Add apple sauce bit by bit until the oats are evenly coated. Add a bit more along with honey if you like some oats to be chunkier than others. Make sure to add a little bit at a time to avoid the mixture getting too wet, which will then make it difficult for the oats to dehydrate in the oven. Once the mixture is combined, spread the granola onto a baking sheet on a flat baking pan. You may have to do this on two separate trays and rotate them in the oven. Bake the granola for 1 hour, taking it out and stirring the granola every 15 minutes so that the oats are evenly exposed to the heat. You will notice that some parts dehydrate more quickly than others, but don’t worry, all you need to do is stir it around every 15 minutes or so until everything is dry. Take the granola out and let it cool before storing them in an airtight jar. If you eat granola everyday this might just last you two weeks! The good thing is that you can make a different granola every time you need to refill! Literally the best way to customise your own HEALTHY breakfast cereal with your favorite ingredients. I love adding granola to a cup of yoghurt, along with banana slices and a drizzle of honey. It helps me feel full quicker and prevents me from snacking all afternoon :P. The best thing about making your own granola is that you can be diverse with it. All you need to stay true to are some basic ingredients and a sense of intuition. For any granola that I make, I use apple sauce (homemade or canned) and honey to make the oats stick together. There’s a common misperception that you need to add oil, but it’s completely unnecessary as long as you have apple sauce. Every other ingredient or spice is totally up to your taste.